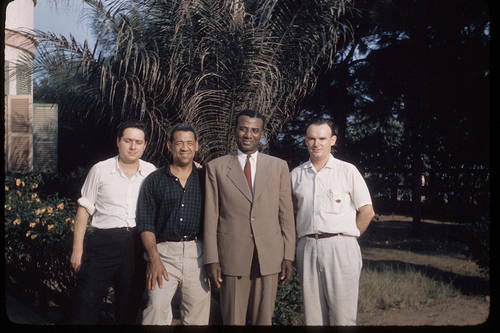 At the invitation of Prime Minster Sylvanus Olympio (second from right), a delegation of the American Committee on Africa (ACOA) visited Togo after attending the All African People's Conference in Accra, Ghana. In 1955 what was know as French Togo became an autonomous republic within the French union but maintained its UN trusteeship status. Olympio became Prime Minister in 1958 following elections. Togo became independent on April 27, 1960 and following elections in 1961 Olympio became Togo's first democratically elected president. He was assassinated on January 12, 1963. ACOA had helped Olympio when he was a petitioner at the United Nations seeking independence for his country. The ACOA delegation, from left, included William Scheinman, Frank Montero and George M. Houser. Not shown is Homer Jack, who was also part of the delegation. This photo was digitized by Clarity Films.